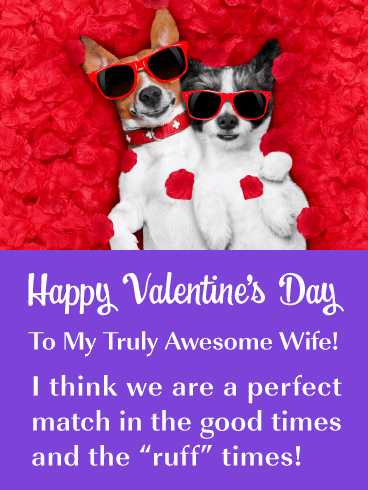 Happy Valentine’s Day - To My Truly Awesome Wife! I think we are a perfect match in the good times and the “ruff” times! 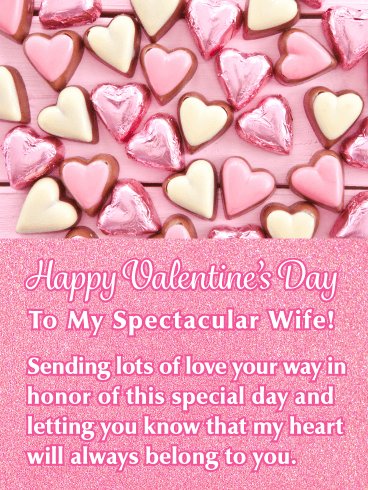 Every wife should receive chocolates from the one they love on Valentine’s Day, so now is your chance to do just that! 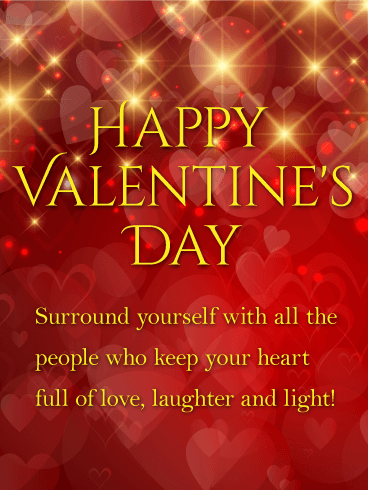 Send this wonderfully designed Valentine’s Day card that showcases chocolates wrapped in pretty pink and gold foil. It also features a lovely sparkling pink background and loving words. 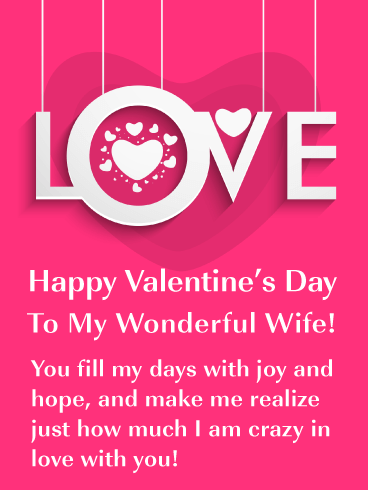 This Valentine’s Day card will allow you to send lots of love to your wife and let her know your heart belongs to her! Fantastic cupcakes with heart sprinkles fill the page of this outstanding Valentine’s Day card. They look irresistible and she is going to just love them! She will also enjoy reading that you are thankful she is your sweetheart and that you will always cherish her. This is the best gift you can give her for Valentine’s Day. 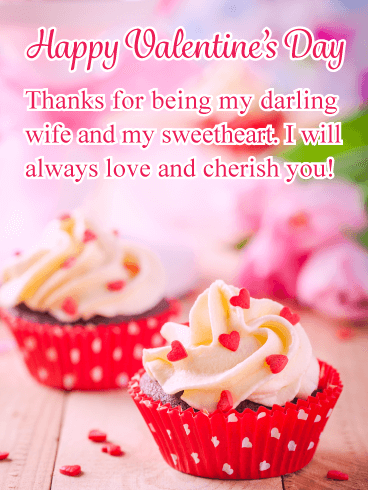 So be sure to warm the heart of your darling wife by sending this wonderful greeting card to her today. 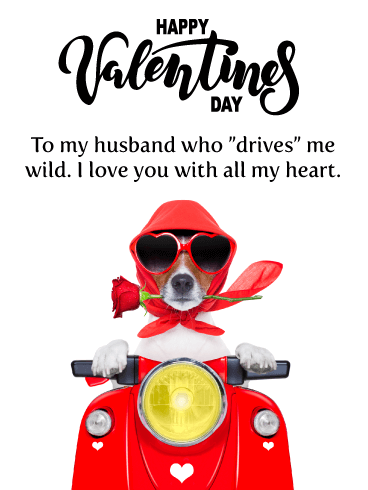 Send a little love and fun over to your wife for Valentine’s Day with this amazing greeting card! It will brighten her day and have her looking forward to spending this special holiday with her one and only. 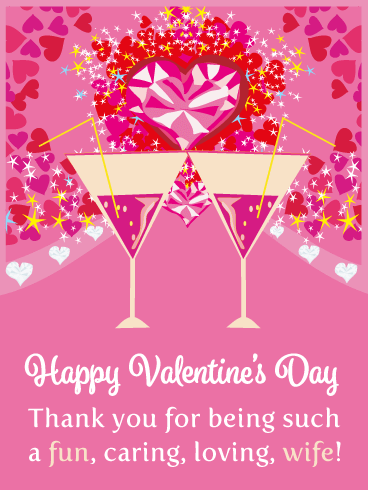 This Valentine’s Day card was designed with fabulous drinks, sparkling hearts, and traditional Valentine’s Day colors of pink and red. It looks terrific! 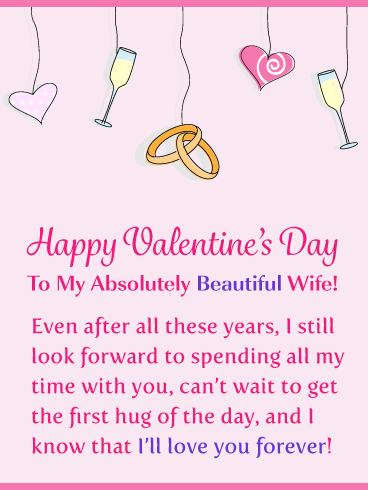 Let your wife know you are thinking of her today by sending this pretty Valentine’s Day card without delay! 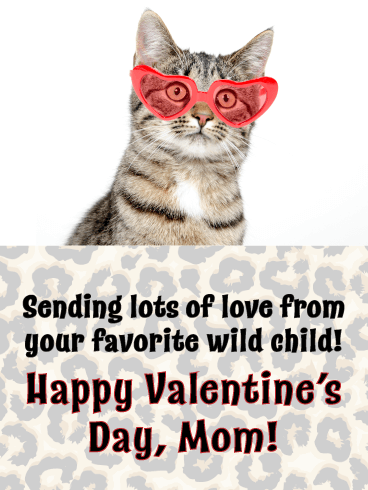 Oh, baby is this Valentine’s Day card going to leave your mom with a big smile on her face! A sweet little tot with kisses all over is too adorable to resist. So much so, it may make her forget anything bad you’ve done over the years. What a great way to stay on mom’s good side while letting her know that you’re wishing her lots of love on February 14th. 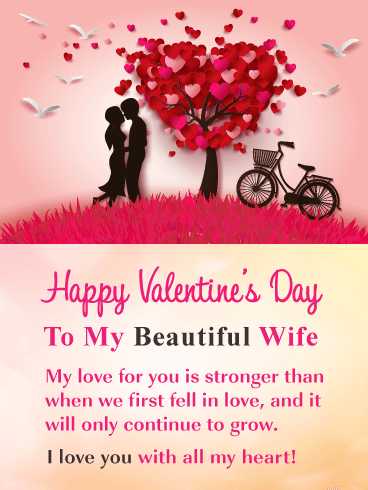 If you are looking for a romantic Valentine’s Day card for your wife, you just found it! This charming greeting card features a lovely scene with a couple standing in a field of pretty pink grass nearby a beautiful tree with heart leaves. It will touch her heart when she reads that your love for her is strong and will continue to grow! 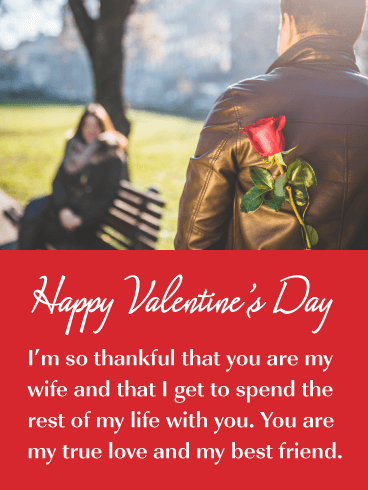 Send this Valentine’s Day card to your wife so you can show her just how much you love her. 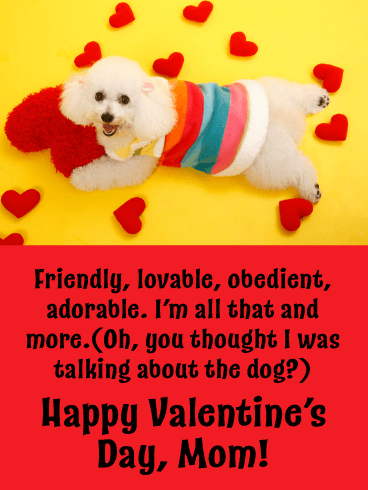 With its bright colors and cute poodle dressed up in a rainbow sweater and surrounded by hearts, this Valentine’s Day card for your mom will make her howl with laughter! Listing all the qualities that may apply to the cute pup, they’re actually about you. For anyone who shares a sense of humor with their own mom, this is a great greeting to surprise her with.